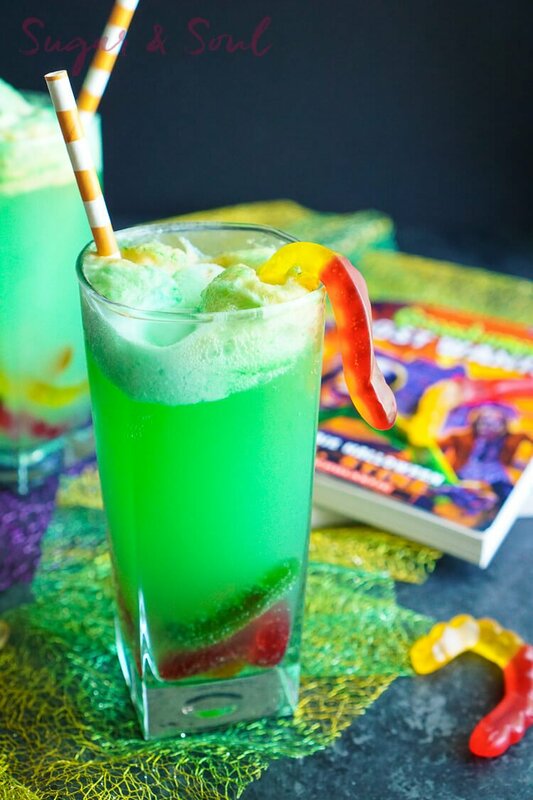 This Goosebumps Halloween Punch is an easy drink made with just 4 ingredients! It’s the perfect addition to Halloween parties too! 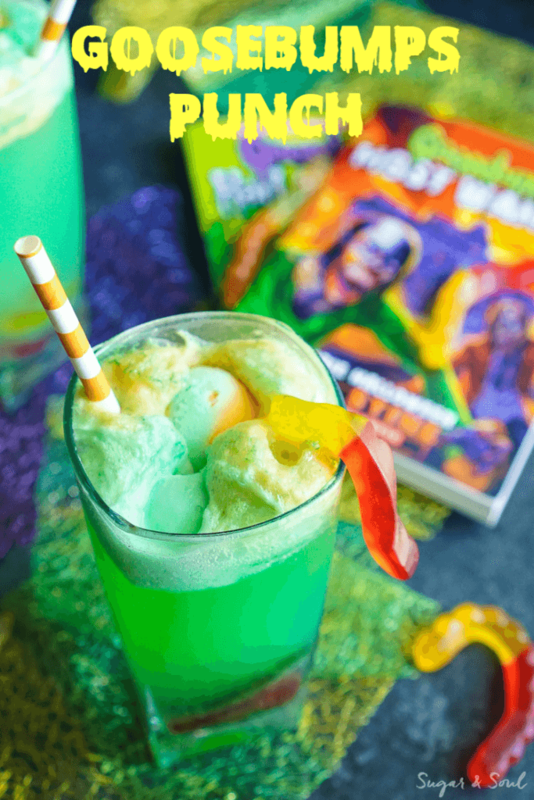 This Goosebumps inspired Halloween Punch is bound to be an instant hit at your Halloween party, plus it’s super easy to make! Let me tell ya something, I’m so so excited for the Goosebumps movie! Like more excited than any other movie coming out for the rest of the year! As a kid, I read ALL of the Goosebumps books and rewatched the TV adaptations like The Werewolf of Fever Swamp over and over again! Did anyone else out there have a slight Goosebumps addiction as a kid? be honest, I haven’t been all that into Halloween in the last 10 years, but stuff like this makes it seem fun again! Especially when I get to whip up fun Food & Fiction posts like this one! 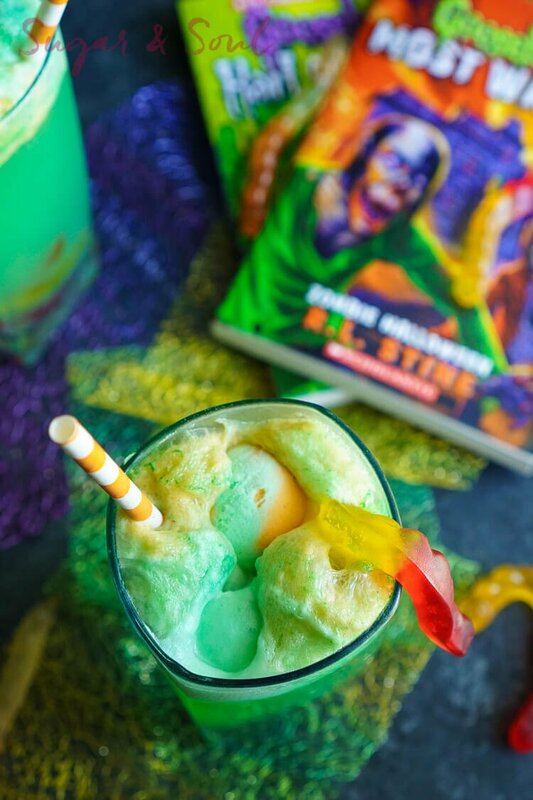 I mean this Halloween punch totally screams Goosebumps, right? And the best part is that it’s super easy to make and pretty tasty too! It’s a great kid-friendly addition to any Halloween or premiere party and the kids could even help you make it! 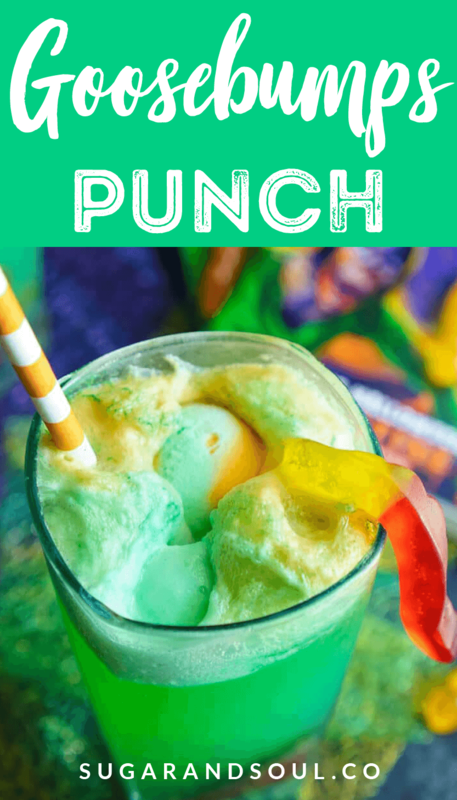 Just mix together some lemon-lime soda and green food coloring, then add in some rainbow sherbet and some gummy worms and you’ve got a super fun punch! Speaking of super fun, don’t forget to serve this punch up with some fun straws and cups! Serve it up while the kids work on their FREE Halloween Coloring Pages! More Halloween Ideas You’ll Love! 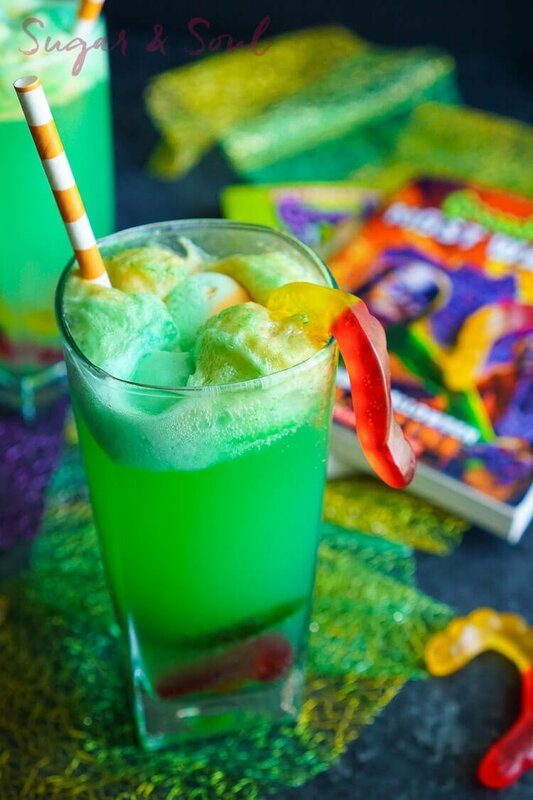 Pin this Halloween Punch Recipe for Later! 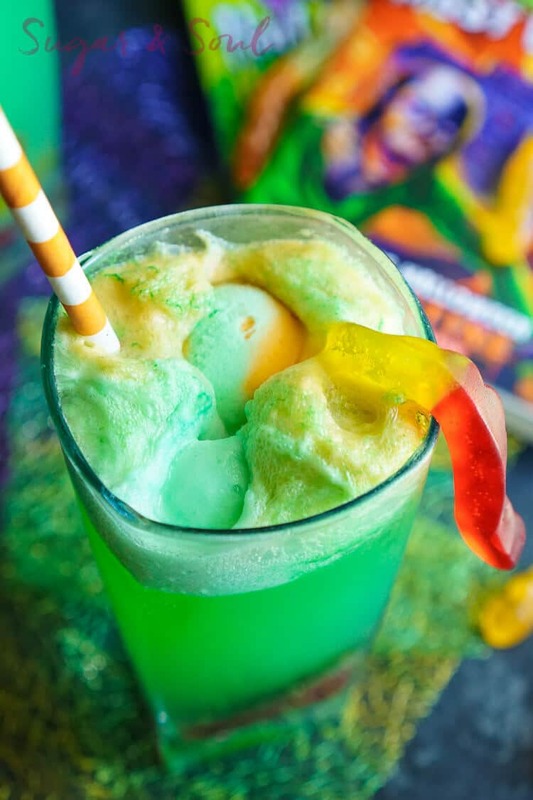 Check out just how easy this Halloween Punch is to make in this video! 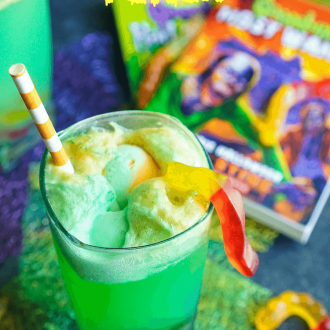 This Goosebumps Halloween Punch is an easy drink made with just 4 ingredients! It's the perfect addition to Halloween parties too! How long can I leave this out for ? Hi Sally, it will be good for several hours. It will lose some fizz and the sherbert will melt over time, but you can always add more to freshen it up! Hey, sorry as as n aussie what would the equivalent be to a sherbert here is that just as sorbet icecream? Hi Milly, A sorbet should work okay, sherbert has milk in it which makes it a little creamier than sorbet, I’m not sure if the sorbet will foam up like the sherbert, but it will still be a fun way to add flavor.